If you have been reading this blog you know that since Billy Ray's major health crisis (2 surgeries in 47 hours and 9 days on a ventilator) in July we have had some issues major behavioral change. Aggression has been more severe than we have ever experienced. Major regrouping has been necessary. The documentation system to get the doctor a clear picture of what Billy Ray was experiencing helped a lot. New medication was added. It was bumpy at first and necessary to have repeated conversations with the psychiatrist. However, we have made significant progress in that regard. It is easy when you are already tired that the visuals and documentation are not important now. In the past few days it has become more obviously that a combination of medical and psychiatric interventions with the things we do at home (visuals, schedules, routines and community activities) is the only way to create a life that works for us. Consistency is so important. Once the schedules and visuals are done there is training of support staff and family so that everyone involved with Billy Ray does things the same way. Last night Billy Ray was moderately manic (silliness, laughing and active). I was thinking how nice it is to be back to his old self. This is more normal for him. So much better than the sound of breaking glass and furniture being knocked over. It felt so good, I just went with his mania (took his hands and bounced up and down with him for a minute). As I have been recreating visuals and schedules for Billy Ray in the past few weeks we have snapped a lot of pictures. They aren't family portraits by any means. Nevertheless, sometimes you get shots that show who he is as a person and give insight into his life and relationships. Just for fun I'll share some of them with you. These pictures are everyday events that wouldn't seem significant unless you know the circumstance surrounding the task. I love the intense way Billy Ray is washing his hands in this picture (taken to make a symbols for wash hands) because we have worked hard to get him to do a thorough job allowing warmer water because he has a tenancy to scratch which adds to his infections issues and because he now has to have the finger stick blood sugars done daily. 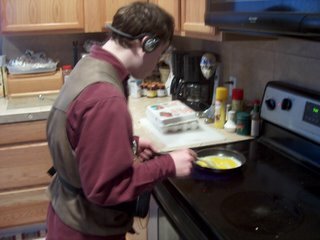 The scrambling eggs picture is from a visual I did so that support staff knows the sequence required for Billy Ray to make his breakfast. 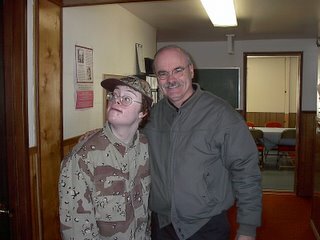 This is Billy Ray with Pastor Richard Lighthill at Grace Fellowship. 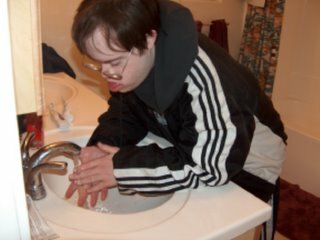 He goes on Tuesdays and Thursdays to do a few chores that he enjoys doing similar to the ones he did at the School District Office when he was still in school. 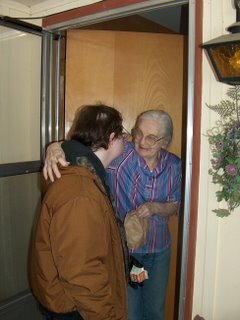 A highlight of these community activities is greeting anyone and everyone at the church. He literally interprets the Men's Bible Study on Tuesday mornings. I told staff to stop allowing him to interrupt but was quickly put in my place by the men in the group. Somedays Billy Ray will shake hands around the table and other times he hugs everyone. His "my men" love it. 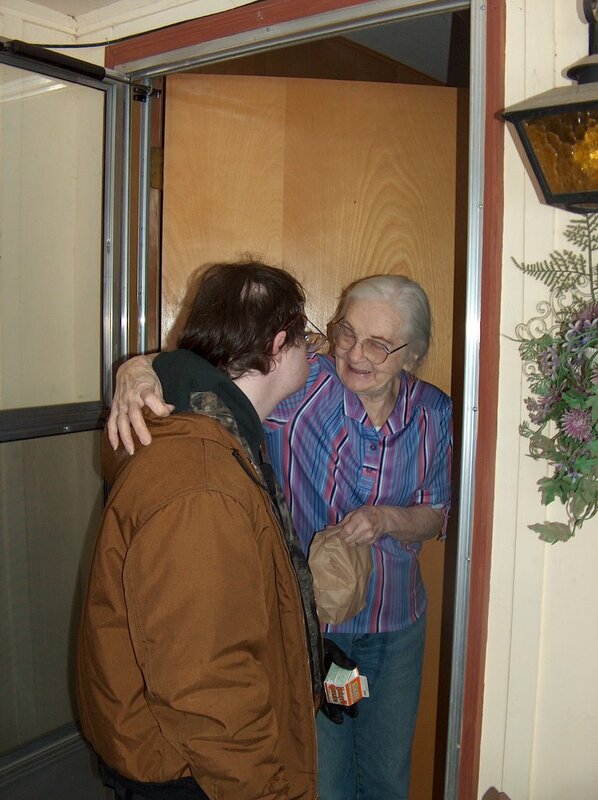 On Wednesday Billy Ray and his support staff deliver meals on wheels through the Senior Center. The picture on the right is with one of the ladies on his route. His people are always glad to see him. I think we may be on the road back to where we want to be. There is a great deal of satisfaction in knowing that we are adding quality to Billy Ray's life by this planning and enabling him to give back to the community in doing things he loves to do. I am working on adding pages to my website with more of his visuals and the forms that will be in my book. I will give you links when they are ready. Hope your holidays are going well and you are having some fun with your children.